Grey's Anatomy Season 11 Episode 11 was utterly heartbreaking. It gave Krystal Sondel, Stacy Glanzman and Amanda Steinmetz plenty to discuss regarding April and Jackson’s tough decision about their baby, various medical cases that seemed impossible and much more. 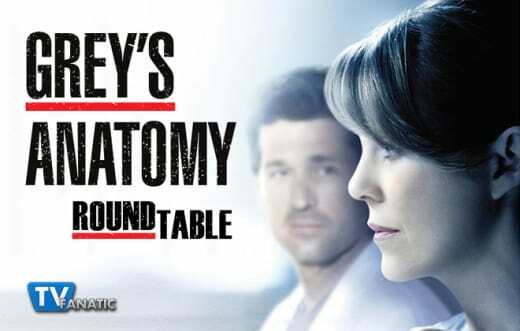 What was your favorite quote or scene from Grey’s Anatomy Season 11 Episode 11? Stacy: That’s tough, it was such an emotional episode. I think I have to go with Amelia telling off Stephanie after they succeeded in restoring the man’s sight. I was definitely cheering for her and I really hope I’m wrong about my prediction that she’ll fail to save Dr. Herman. Krystal: Maggie telling Meredith that she could be her person and that she loves baking. She keeps surprising me! I’m glad Meredith is letting her in. Amanda: I have to go with Jackson in the chapel. He loves April more than anything and despite his personal feelings about religion, prayed for God to be there for her. Such a sweet and sad scene. Was this the saddest Grey’s Anatomy ever? Stacy: Oh man, that’s tough. It’s definitely close to the top, but I think I would give the edge to Denny. Krystal: There have been so many episodes that have made me reach for my box of tissues, including this one. Saddest ever - George dying was more shocking to me than this outcome, but as far as connecting more to a story - yes, this was definitely the saddest for me. Amanda: Definitely sad. There’s no denying that, but this episode didn’t actually make me cry. There’s two top cry episodes for me. “Into You Like a Train” with the two train passengers stuck together with a pole and the girl knowing she was about to die. The other is “Losing My Religion” where Denny dies. What did you appreciate most about April and Jackson’s tragic story? Stacy: That they never turned on each other. So often something like this tears couples apart, but they supported each other through the whole thing and I believe they will be able to eventually help each other move on. Krystal: That Catherine Avery was there and found a way to console April. It was beautiful, and so different from when April’s Mom came to town to visit. She said just what needed to be said. Amanda: I love this storyline for April. Her faith is a large part of who she is, and this is the ultimate test for her. She saves people’s lives, and I think feels unfairly punished by God. I’m curious to see how this experience changes her perspective on faith. Which medical case was more interesting to you? Stacy: They were both interesting, but I’ll give the edge to the woman who didn’t know she was pregnant. I’ve never really understood how that was possible, but I know it happens. I always wonder what those parents do - shouldn’t dad be running out to buy a car seat and a crib? I just can’t imagine the scramble to get everything you need to take the baby home. Krystal: Definitely agree about the pregnant woman story. Wow! What a day. As Bailey said - more than most people go through in a lifetime. I was so happy that this couple had their chance to have the baby they both wanted so much. Amanda: I’m giving the edge to the pregnant woman. Like Stacy, I’m always baffled when I hear about these women who didn’t know they pregant. I guess it is possible, but still weird nonetheless. Are you missing Derek? How’s Meredith doing without him? Stacy: Honestly, I barely even noticed his absence. 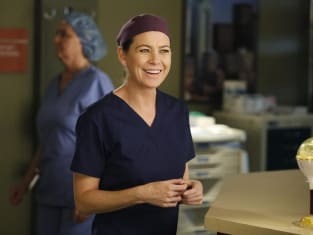 I think Meredith needs to hurry up and hire herself a nanny, but at least she’s got a sister who loves to babysit. Krystal: He’s McDreamy, so yes. But, to be honest I have to agree with the others, I am not missing him as much as I thought I would. Amanda: I haven’t really felt his absence, but I’m glad we don’t have to see them fighting all the time now. I think she’s doing fairly well except dealing with the kids. Good thing Maggie likes to bake!